and safety rules for revolvers and semi-automatic handguns. Students are men and women (at least 21 years old) from all walks of life who want to know the essential knowledge, safe practices, and basic skills for handgun use. Some students have little or no experience with firearms of any sort, but they want to know about handguns for their own benefit. 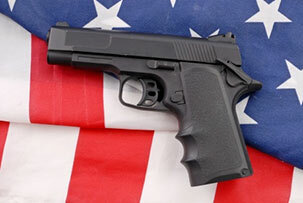 Others have prior experience with firearms, but have never dealt with handguns. Still others have prior experience with handguns, but need the basic training for safe and effective use of pistols. Moms and dads want to know how to protect their children from accidents involving handguns. Everyone who enrolls in this course is treated as an individual learner. Their instruction in handgun knowledge and skill is tailored to their personal background and interests. Ample opportunity is provided for students to ask questions, discuss issues, and inspect and handle a wide variety of handguns. Please call 1-860-455-1229 or email us at info@ForesightForGoodGuys.com. 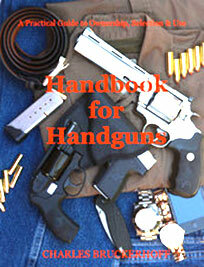 Students who enroll in the Foresight Basic Pistol Shooting Course receive a signed copy of Handbook for Handguns. Successful completion of this course enables graduates to pursue the "Connecticut Permit to Carry Pistols and Revolvers" and to meet handgun purchase and/or carry permits in other states or jurisdictions where this NRA-certified course is a basic requirement. Since this course emphasizes firearms safety, the practices and procedures will be of benefit to you for life, no matter what may be your personal interests in handguns. Visit the CT Department of Public Safety website for Special Licensing and Firearms. Visit the National Rifle Association's website. This course is active, engaging, and informative, thus the student should ask questions and also expect to handle real pistols and revolvers throughout the day. Opportunity will be available for gaining familiarity with both revolver and semi-automatic pistols. The student will complete live fire at a paper target on the pistol range with at least one small caliber pistol. The instructor will directly supervise every student’s live fire experience. Also, the student completes a multiple-choice, true/false type exam to assess their knowledge from the Basic Pistol Course. An official Basic Pistol Certificate is provided to each graduate of the course. What to bring: Pen or pencil, notebook, and baseball cap. Food and Drinks: In addition to hot and cold beverages, a continental breakfast and lunch are served. Keep your finger off the trigger until ready to use! Keep the muzzle pointed in a safe direction! Keep the gun unloaded until ready to use! Believe this: A firearm is always loaded! Store firearms in a locked safe or with a trigger lock. Store ammunition in a locked container separate from guns. Know this: Unlawful storage of a loaded firearm may result in imprisonment or fine. Stop what you are doing immediately: Do not touch the gun. Tell a responsible adult immediately. Remember this: Children know where everything is stored and they will access it when you least expect. We are listed on the Outdoor Ninjas website, a resource dedicated to providing its readers with helpful advices and tips about hunting, fishing, self-defense, survivalist skills and other outdoor activities. Email: info@ForesightForGoodGuys.com © Foresight, all rights reserved.